When designing luxury homes or fine hotels, you need to focus on elegant choices that people are sure to love. However, that doesn’t mean that you have to stick with soft tones in white, ivory and tan. You can go with something bold that will stand out, yet still create a sophisticated environment that’s sure to impress your customers. Black granite window sills are an example of an impressive choice that will make you stand out as a designer while pleasing potential customers. Even the most demanding clients will appreciate the unique look and style. Before you place an order for wood sills or even a different color, consider the many benefits of going with elegant black marble. When it comes to window sills, there are a few choices to consider. Wood is the most common and basic of the choices, and you can certainly give a wood sill the sleek black color of granite. However, there is no way to make wood last longer should it become wet, be exposed to the sun on a regular basis or have extreme temperatures to contend with. These are all situations that can degrade the paint, harm the wood and ultimately leave the material cracking and splintering. Plastic can be used instead of wood, but this only lasts 15 to 30 years before the material is degraded enough by the sun that it will start to yellow and break. Only natural stone like granite can last a lifetime and prove to be every bit as durable as the home itself. While other materials will fall apart with the passage of time, the granite will only take on the beautiful patina that makes it even more attractive. When people are looking at homes, they pay attention to the different windows that are in place throughout the property. They look at the size and placement to get a feel for how much light and air they’ll bring into a room. One of the best ways to highlight the windows and make them seem larger and more elegant is with a bold window sill. The sleek black granite features a color that will stand out against any wall to highlight the opening and create an impressive look. The contrast can also help break up an expansive wall to make the room feel more welcoming and comfortable. People expect a lot of their homes and buildings. They expect the basic materials to hold up and last for years with just a little maintenance, and this goes for the window sills as well as floors and other surfaces. You can count on people to lean on the window sills, display heavy items in them at times, and even stand in them once in a while when they’re painting the room. This is why it’s important to choose strong materials that can withstand the regular use and even abuse of most consumers. Natural stone is a dense material that’s solid throughout the piece, and it’s known for its strength. Marble and granite are far superior to both plastic and wood when it comes to sheer strength, and that’s good news for your future clients. When people are considering neutral colors, they often look to white and even tan. However, black is also a neutral shade that works better in many situations. Bold granite looks fantastic with every color of the rainbow, and it can also cross between many different design styles. Whether your future clients want a traditional design in the living room or are dreaming of contemporary bedrooms, the black granite will work beautifully with their design theme and add an elegant feel to the room. If you’re worried about how the black granite will look set against wood trim with a natural finish, you can rest easy. Just as granite makes an impressive finishing touch for all types of wood cabinets in the kitchen, it will also make an amazing choice for wood framed windows throughout the home. It may surprise your clients to learn that granite is also a green option. It’s important to keep in mind that there’s more to green materials than availability and how renewable they are. While it’s true that natural stone takes a long time to form, it’s important to remember that the stones can be reused or repurposed with very little processing. Not only will the granite last as long as the building, but the stone can be recycled should the owners every decide to do something different. The plastic used in window sills, on the other hand, requires a great deal of processing and is rarely recycled. While you may not have to worry about the ongoing maintenance of a product as the builder, it’s still something that your customers are taking a close look at. People want buildings that look great and feel elegant without setting themselves up for unnecessary work. The beautiful thing about granite is that it can be easily cleaned with a damp rag and a little gentle detergent. There are also special formulas available to buff away marks and restore the lovely shine. Your customers will appreciate your forethought in using materials that are easy to care for and sure to last a lifetime. Whether you’re building a single custom home or you’re working on a larger project, you want to save on your basic supplies in order to improve profit margins and keep rates low for clients. In addition, you also want quality materials that will last for decades and provide you with the beautiful look you expect. At StonExchange, you can expect to receive excellent customer service, prompt shipment of products, quality pieces and wholesale prices. We pay close attention to detail because we want you to be completely satisfied with your order. 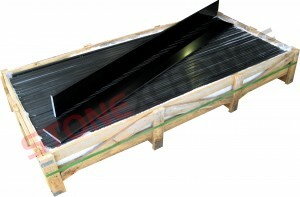 All shipments are carefully packaged to minimize breakage and ensure that your project continues to run smoothly. You’ll save by ordering in bulk, but you can also order items when needed to save space in your personal warehouse. We make this possible by maintaining contracts with the nation’s top delivery companies so that you can receive your order in a timely manner. If you’re ready to make a great impression on your customers by switching to elegant and luxurious materials like granite window sills, then contact us today.